Spouses who cared for a loved one with Alzheimer’s disease were much less likely to place their partner in a nursing home if they received targeted counseling and support, researchers report. This delay in institutional care can be beneficial for both family members and those with Alzheimer’s and save millions of dollars in health-care costs. The findings, based on results from a long-running study led by Dr. Mary Mittelman and colleagues at the Silberstein Institute at the New York University School of Medicine, appeared in the November 14 issue of Neurology, the scientific journal of the American Academy of Neurology. Making the decision to place a loved one with Alzheimer’s in a nursing home can be a wrenching decision for any caregiver. Although such a move may ease day-to-day burdens of care, it can cause considerable distress in care partners. For example, it may evoke feelings of guilt, worries that loved ones are not receiving adequate care, and conflicts with professional staff. Nursing home care is also very costly. Home care can also benefit the person with Alzheimer’s, who is being cared for and supported in a familiar and loving environment. It can be very difficult and confusing for someone with Alzheimer’s to adjust to a strange new environment like a nursing home. The move can cause disorientation, and sometimes a worsening of symptoms. Nevertheless, nursing homes can be a valuable option for overburdened care partners, particularly as the disease progresses and symptoms become more severe. In the current study, NYU researchers studied 406 spouse caregivers for up to 17 years. Half of the spouses received enhanced counseling and support services. This targeted support included six sessions of individual and family counseling, participation in a support group, and the availability of ongoing telephone counseling as needed. The remaining half received the standard care available at NYU. This routine care, better than in many places, included information, guidance, and access to counselors and support groups for caregivers and family members who requested it but no formal counseling sessions. Study participants were also given regular in-depth questionnaires. The surveys addressed such issue as levels of stress, how they were coping with the demands of home care, physical complaints, problem behaviors related to Alzheimer’s, and how they felt about support from family and friends. Caregiver spouses who received the enhanced counseling and support delayed placing their ailing spouse in a nursing home by one and a half years compared to caregiver spouses who received standard care. The study also found that caregivers who received the enhanced counseling were more satisfied with the social support they received from family and friends. They were also better able to tolerate “problem behaviors” in those they cared for. These factors appeared to play a large role in allowing caregivers to keep loved ones with Alzheimer’s to remain at home. “Delaying placement was not accomplished at the expense of the caregiver’s well-being,” says Mittelman. “Caregivers in the treatment group were not only able to keep their spouses at home with them longer, but as a result of the intervention had greater tolerance for patient memory and behavior problems, improved satisfaction with the support provided by family and friends, and fewer symptoms of depression.” These finding are consistent with earlier reports showing that enhanced counseling offers a bounty of benefits for Alzheimer’s caregivers. Such benefits include easing feelings of sadness and isolation and bolstering feelings of well-being. The researchers note that greater access to effective programs of counseling and support could yield considerable benefits for caregivers, people with Alzheimer’s disease and other chronic illnesses, and society at large. Enlisting ongoing help and support throughout the care-giving process can be critical for maintaining well-being and helping to manage the extreme demands of caring for a loved one with Alzheimer’s disease. For more help on care-giving, visit www.ALZinfo.org. By www.ALZinfo.org, The Alzheimer’s Information Site. Reviewed by Mary Mittelman, Dr.P.H., Director of the Psychosocial Research and Support Program at NYU School of Medicine’s William and Silvia Silberstein Institute on Aging and Dementia. 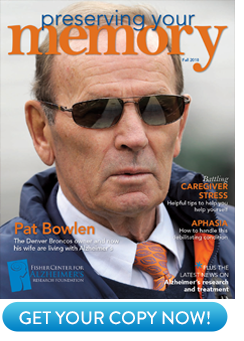 Dr. Mittelman serves on the editorial advisory board of the Fisher Center for Alzheimer’s Research Foundation. Mary S. Mittelman, DrPH; William E. Haley, PhD; Olivio J. Clay, MA; and David L. Roth, PhD: “Improving Caregiver Well-Being Delays Nursing Home Placement of Patients with Alzheimer Disease.” Neurology, November (1 of 2) 2006, Volume 67, pages 1592-1599.